The positive recognition we continue to receive from expert olive oil tasting panels demonstrates Pacific Sun’s consistent success in producing quality gourmet California extra virgin olive oils. Pacific Sun Gourmet proudly announces that three of its extra virgin olive oils received high honors from judges of the 2012 California Olive Oil Council Competition. The California Olive Oil Council Tasting Panel awarded Gold Medals to Pacific Sun’s Tehama County Blend Extra Virgin Olive Oil and Proprietor’s Select Ascolana Extra Virgin Olive Oil. A Silver Medal was awarded to Pacific Sun's Eva’s Blend Extra Virgin Olive Oil. “Our Pacific Sun Gourmet family is proud to be recognized with two Gold Medals and a Silver Medal at such a prestigious event. The positive recognition we continue to receive from expert olive oil tasting panels demonstrates Pacific Sun’s consistent success in producing quality gourmet California extra virgin olive oils.” said Brendon Flynn, Pacific Sun Gourmet general manager. 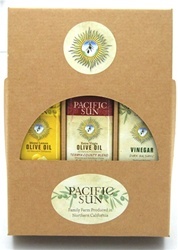 Since 2003, Pacific Sun has earned a total of 32 gold medals, 15 silver medals and two bronze medals from prestigious olive oil competitions such as the Napa Valley Olive Oil Competition, Yolo County Fair, the Los Angeles International Extra Virgin Olive Oil Competition, and the California Olive Oil Council Competition. Pacific Sun Gourmet is a woman owned, family operated business that is part of Pacific Farms & Orchards, Inc., a third-generation family farm that has been owned and operated by the Flynn family in Tehama County, Calif., since 1952. Mrs. Flynn raised six children on the farm before becoming a "farmer by default" after her husband's untimely death in a plane accident in 1986. She felt a responsibility to the men who worked for her husband and her family to keep Pacific Farms going. Pacific Farms now employs 25 year-round dedicated individuals who have an average tenure close to 15 years. In addition to producing award-winning extra virgin olive oils and providing turnkey services for olive oil production, Pacific Farms produces orchard crops such as prunes, walnuts, almonds, and olives. More information can be found at http://www.pacificsunoliveoil.com.